Is your Kung Fu strong enough? Kung Fu Funk: Everybody is Kung Fu Fighting! is an off the wall 1970s Kung Fu movie themed party game. 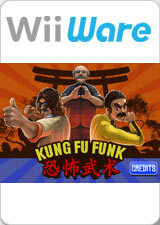 Challenge up to three of your friends to see who has what it takes to become the ultimate Kung Fu master. There are many trials to overcome in three zany game modes. True to any Kung Fu movie you start with learning the Zen arts, a chilled out mode to get you familiar with the controls. Once your skills are fully waxed you enter the Kung Fu training movie montage which consists of insane mini-games. Once your skills are honed, you enter the ultimate battle as the instructor in your own disco Kung Fu dojo. The graph below charts the compatibility with Kung Fu Funk: Everybody is Kung Fu Fighting! since Dolphin's 2.0 release, listing revisions only where a compatibility change occurred. This page was last edited on 19 January 2018, at 00:50.